UNITED NATIONS -- Deep divisions were evident during an emergency meeting of the U.N. Security Council on Friday as members debated the U.S. missile strikes on a Syrian airbase, CBS News’ Pamela Falk reports. U.S. Ambassador Nikki Haley told the council the U.S. couldn’t wait to act following Tuesday’s deadly chemical attack and “took a very measured step last night” with its strikes against the Assad government. She warned the U.S. is prepared to take further action in Syria but hopes it will not be necessary. “We are prepared to do more, but we hope that will not be necessary,” Haley said. Haley said that while the Syrian government was responsible for the chemical attack, Iran and Russia bear “heavy responsibility” for propping up and shielding President Bashar Assad. She told the council that Russia is supposed to be a guarantor that all chemical weapons were removed from Syria under a 2013 agreement. “The world is waiting for Russia to act responsibly in Syria,” Haley said. He said Russia firmly stands by the Syrian government, calling it the main force against terrorism and saying it deserves the presumption of innocence in the chemical weapons attack. The missile strike on Thursday came shortly after the Security Council abandoned efforts to adopt a resolution regarding Tuesday’s chemical attack. 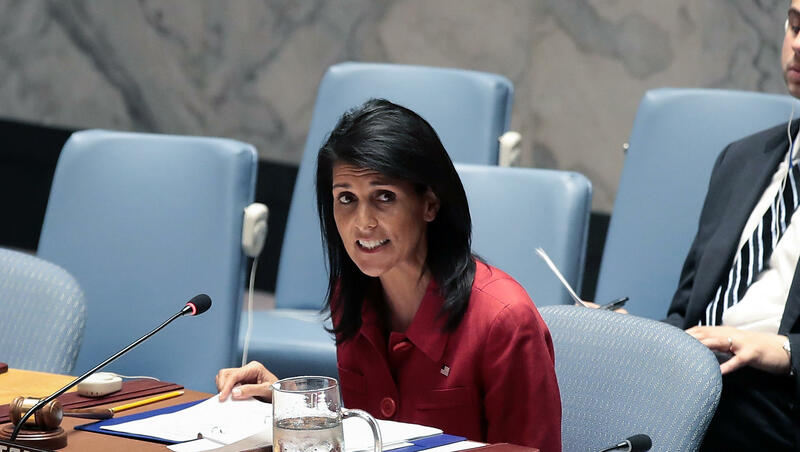 Before the missile strike Thursday, Haley told the council the U.S. might be “compelled to act” if the U.N. failed to take steps to hold Assad accountable for the use of chemical weapons on civilians.